Emma’s party has been on my mind since she was first born. It’s crazy how as a mommy you begin thinking about these things so early on in your child’s life. When I would mention something to JR about this or that for Emma’s birthday he would look at me like I was crazy and say, “do you REALLY need to be planning that now?” After seeing the party come to life, I think he may understand now why it was so important to plan it all so early. I know that we couldn’t invite anyone and everyone to come to Emma’s first party, so I wanted to invite you to it on here. So, let’s get this party started! 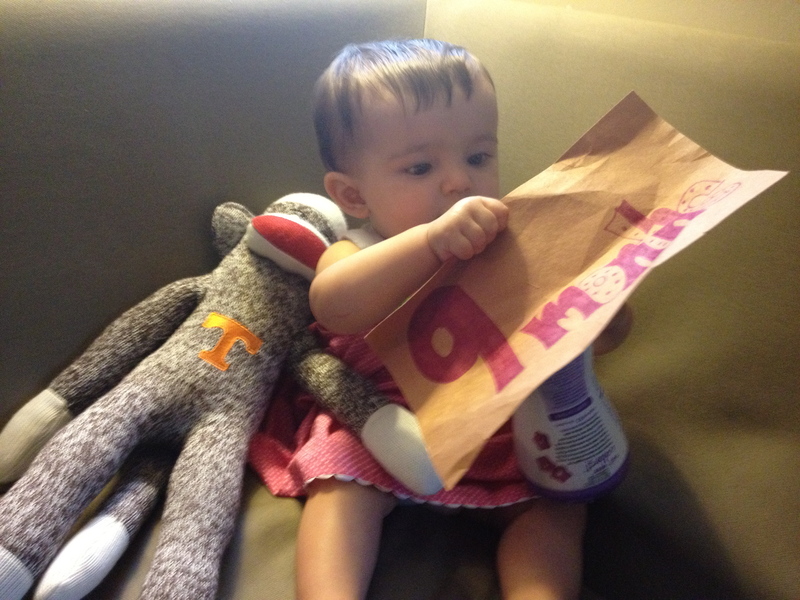 Bananas, Monkeys, Letters and Tulle! Use what your momma gave you! Basically, this translates to use what you’ve got. We already had several sock monkeys so right off the bat we knew they wouldn’t be hard to come by, not at all. We were also able to borrow a lot of items. The key to this is don’t be afraid to ask! Our friends and my brother and his wife all used mason jars at their weddings. They borrowed these from a dear friend, Debbie. I asked Debbie if I could just take them home with me and she said sure. We decided to use this for the adults to drink from instead of buying paper or plastic cups. We made sure to wash these before returning them to Debbie. It’s rude to borrow stuff and not keep care of it. If people are willing to bless you, be sure to bless them back with NO WORK to do. For decorations, we used several different borrowed things. At my brother’s wedding they used several pieces of tulle, rocks and vases that they didn’t want to keep. I scooped those up, too, and we used them at her party and donated them to the church when we finished. 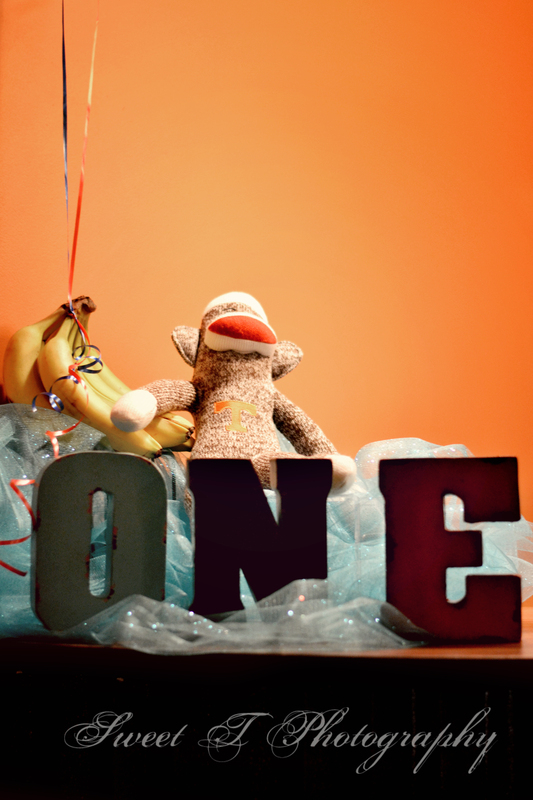 At Emma’s boyfriend’s party, he had the letters to spell out “one” and they matched our sock monkey theme perfectly. I asked where they got them (hobby lobby, of course!) and planned to go buy them. As we were leaving, they offered to bring them to church and let us use them for Emma’s party. Sure! We were able to get some great pictures with these letters, too. As far as food goes, we were able to get by with some things for free here, too. We love bananas at the Linkous house. I stocked up on some for us to eat and we used these for decorations, too. They were FREE for the party because they were really for us to eat at home. I also began stocking up on stuff that I got free to make ice cubes. 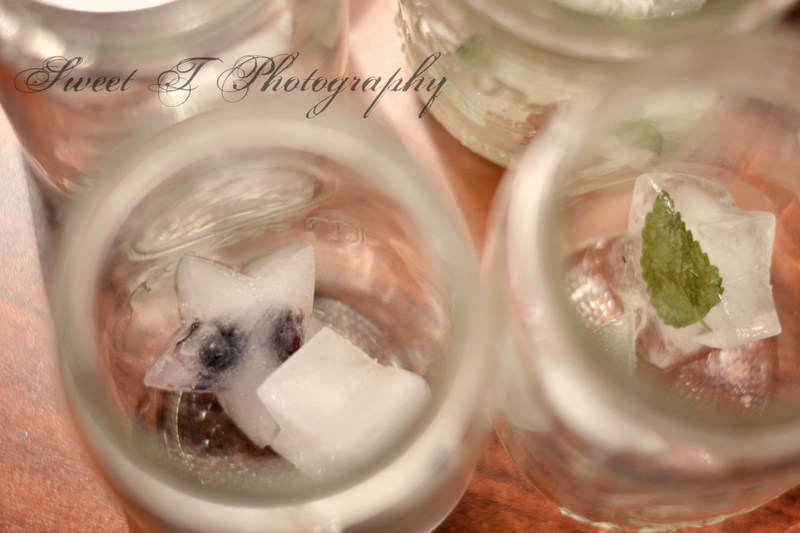 I spent weeks making mint and blueberry ice cubes since we decided to do water only. Water is a cheap drink so I wanted to spice it up with some fun ice cubes. No caffeine or high sugar juices at this party. No. Thank. You. One last thing we did was decorate using things from Emma’s first year. All the cards I had made to take pictures each month were used as a banner. I hole punched all the cards we received when she was born and strung them together for people to look at. I plan on doing this every year so she’ll have a collection of cards to look at when she’s older. We also used pictures around the room and a slide show JR made. When JR and I got married we received a notebook where people had cards and wrote their wishes for us on them. 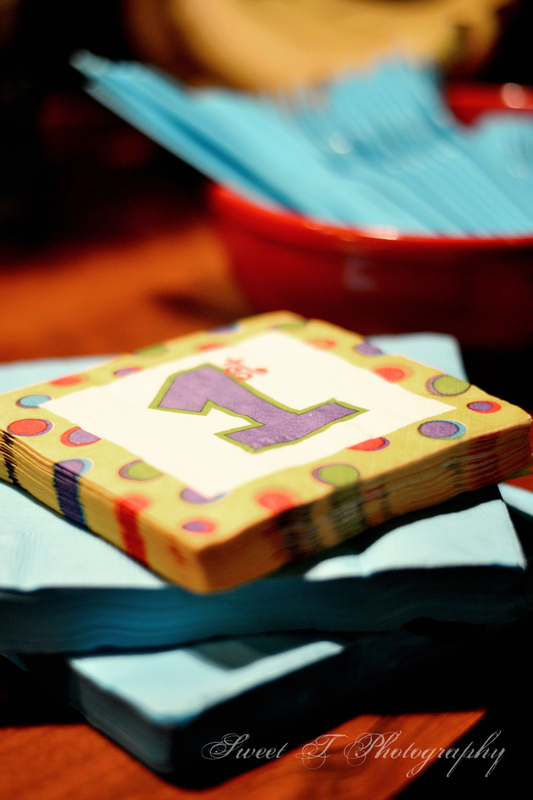 We had a TON of extra cards from that and used them for Emma’s 18th birthday. We had people write wishes on these and will seal them in an envelope for her to open on her 18th birthday. A super sweet and sentimental idea that cost us $0.00. You better shop around! 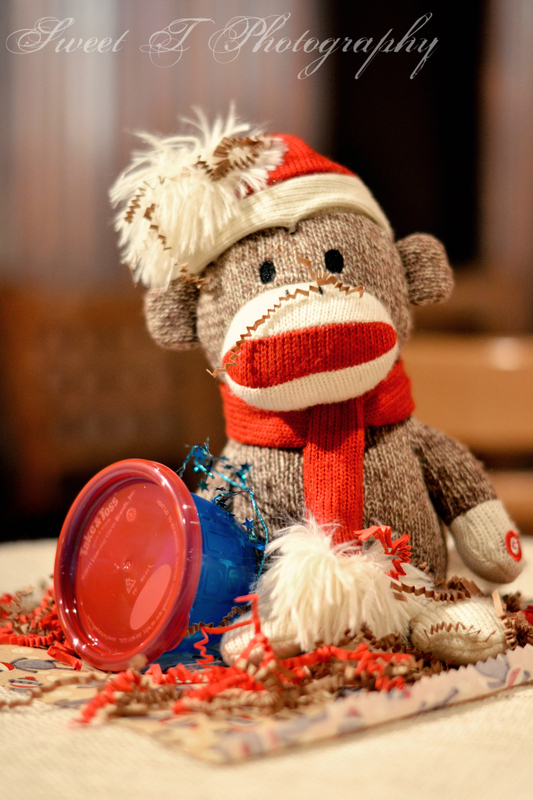 We knew this party meant we needed to look for things in sock monkey colors and themes that we couldn’t get for free or borrow. We really found some great deals, too. Back in November, I was able to get several napkins, plates, and utensils on clearance that had “themed out”. I got these for less than $5 and we have extras at the house. I was planning on using serving bowls for the fruits that I already had and kid cups we had for the kiddos. As I was going through Target one day, I stumbled upon white and red bowls of all sizes along with kid size cups on super cheap clearance. I got three large bowls, four medium bowls, four little bowls, and twelve kid cups for less than $5, too. We are going to be able to repurpose these and use them for Emma’s kitchen set she’s getting for Christmas. For our gifts for the other kids, that cost us minimal, too. Everything I used for it was found on clearance and split up into multiple bags. We were able to do 12 kid bags for $.75/each. 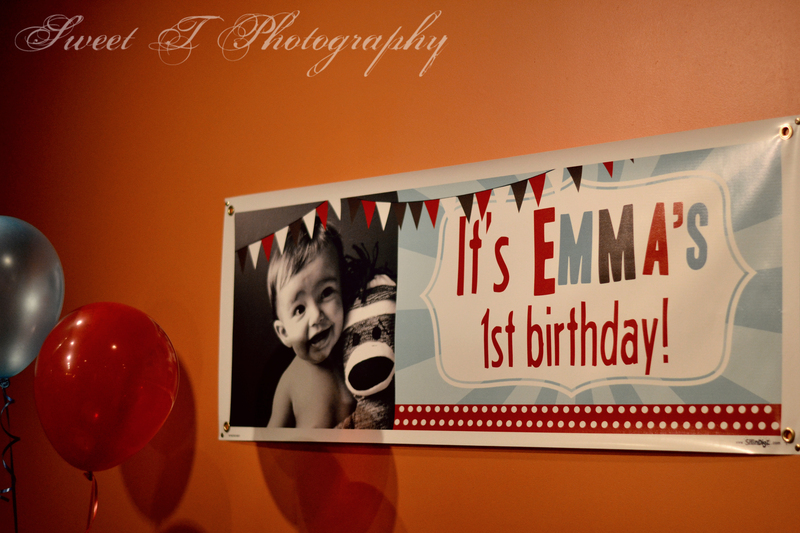 One of the last things we got for a great deal was Emma’s invitations and her banner. My husband is a graphic artist by trade so we were able to get some AMAZING design work done for free. Thanks baby! For the invites and the banner, all we paid was $10 for printing. We only put postage on a few invites and handed out the rest. Know where you don’t mind spending extra. 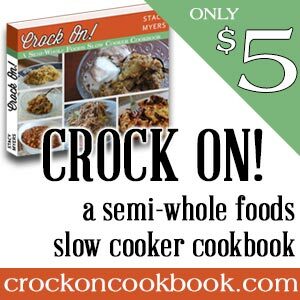 We knew food wouldn’t be cheap and we saved money elsewhere to make this possible. We had a mid day party and did a light meal of just fruit and stuck with Emma’s favorites- watermelon, pineapples, and strawberries. We bought enough that we wouldn’t run out and knew we would eat it. Emma loves fruit. We spent about $15 on all of this by shopping around at the right places. I will say this- I wasn’t crazy about the strawberries. I hope I didn’t offend anyone with our strawberries. Next time I’ll do better. I think we made up for it on the desserts. 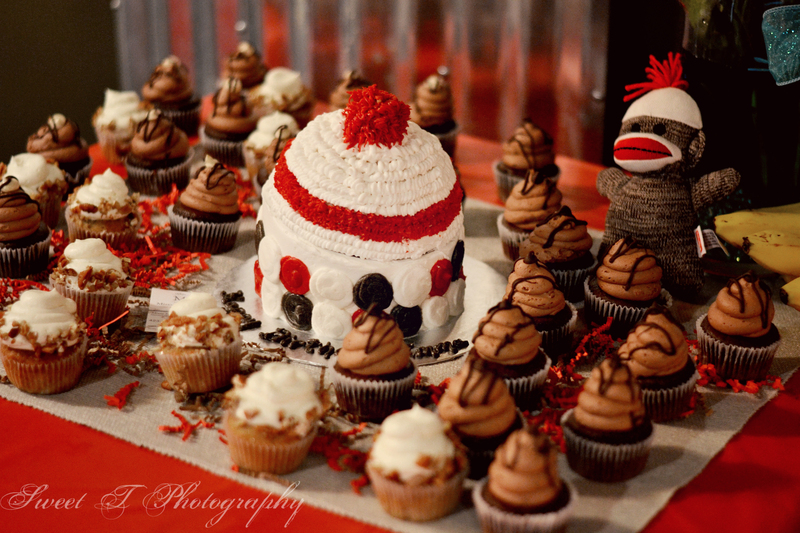 Missy’s Custom Cakes made Emma’s sock monkey cake that was her smash cake and that cost us $20. 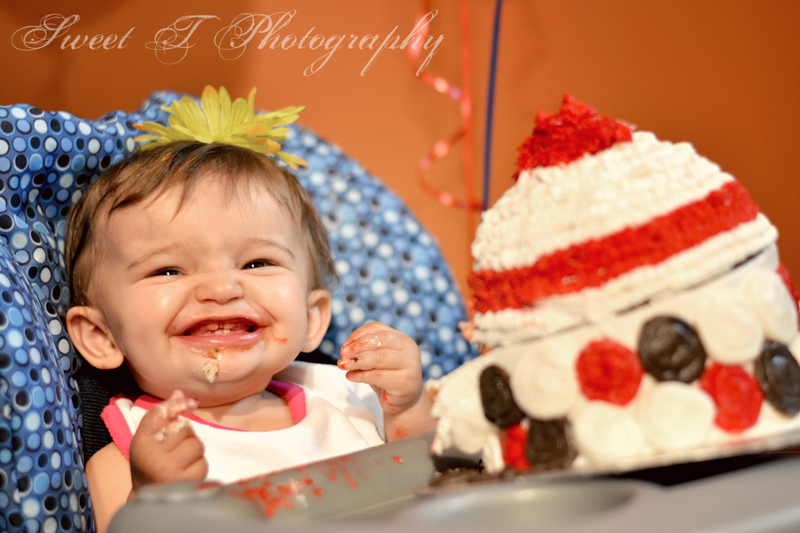 Emma loved her cake. Mommy and daddy loved her cake, too. Missy did a great job and we definitely recommend her! We also had a friend make some AMAZING cupcakes of all flavors- peanut butter, cookie butter, and hummingbird. We got four dozen of these for $30. This was a little pricier but it’s somewhere I didn’t mind spending extra. It was totally worth it when I took a bite. We also had extra food leftover for our small group the next night so it’s like it paid for two meals instead of one! Keep in mind that you have to have a budget otherwise you will loose your mind. Be reasonable and decide what you’re willing to spend and stick to it. You’ll be thankful you did! Barter! If you have gifts and talents, trade them. 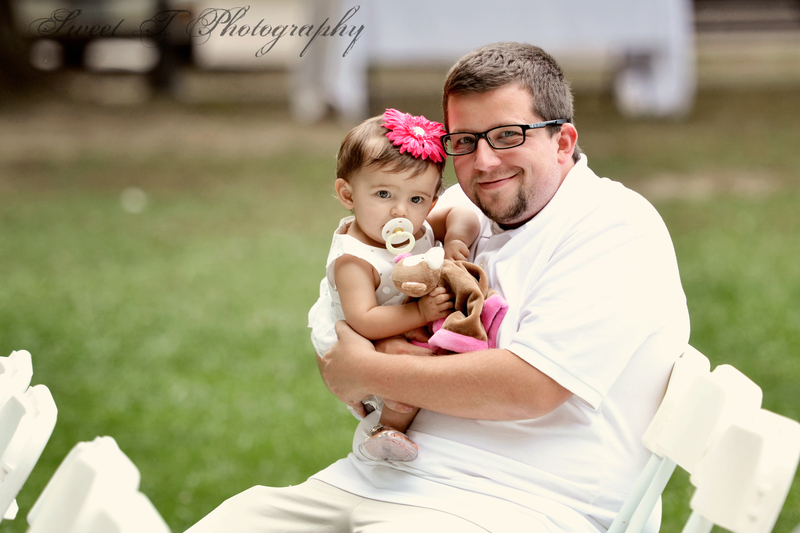 My husband is a graphic artist and we have a good friend who is an amazing photographer. Trade some things here and there and it’s a win for everyone! We all get something without paying a dime and get something in return that we needed. We also have amazing friends who are Emma’s God family and they helped decorate and buy things, too. We all got there at 11:30am to begin decorating for a party that started at 2. You know what? We could have started at 9 and still been rushed. Baby parties are big. Don’t mess with them. At the end of the day, Emma had an amazing day! 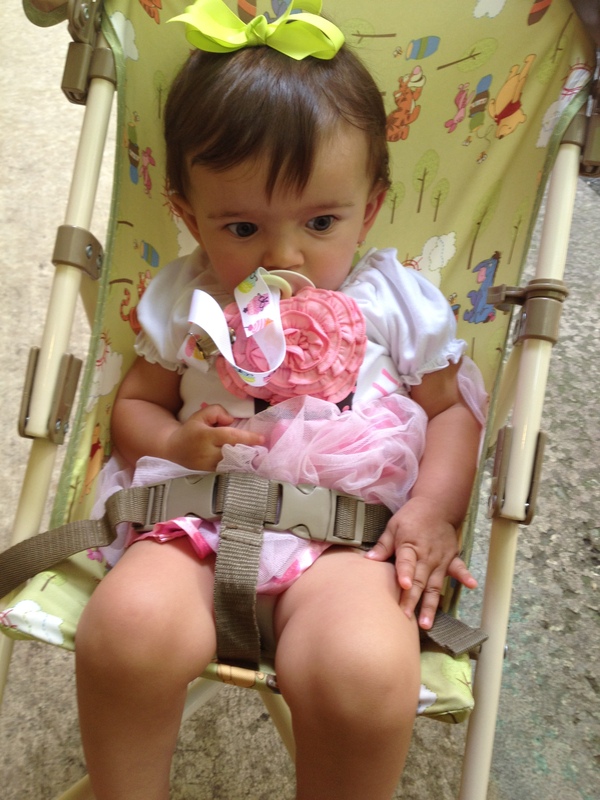 She was able to wear and use the things I made for her last week- her tutu, her shirt, and her plate. It was precious to see these things put to use and although it cost me time, it meant so much more than something store bought. She had a blast and we had some amazing memories made together with not just us, but with additional family and friends, too. Even my amazing grandparents were able to make the trip down (thanks Uncle Bruce!). This party was definitely more for us than for Emma when it comes to memories but was worth what we put into it. And we stuck to our budget and had $6 left to spare. I bought myself dinner afterwards with that. There was no way I was going home and cooking. We were pooped! 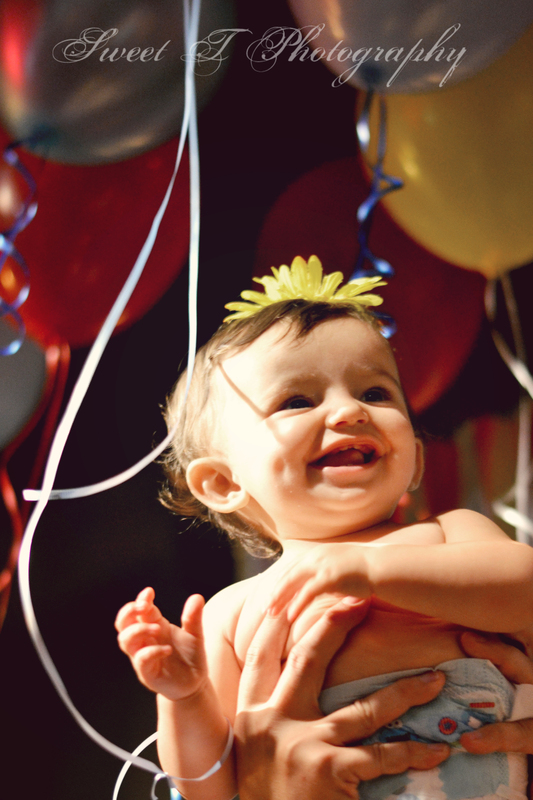 We hope you’ve enjoyed traveling into our world of the first birthday party. It was fun and we can’t wait for number two! The day of her birthday, Emma woke us up around 7am to cuddle. Mornings with Emma are my absolute favorite. She wakes up crying but not to eat. She wants to snuggle with mommy and daddy. She curls up beside us and goes to sleep. Watching her is truly a beautiful thing. Around 7:45 or 8, I make her get up and eat but sometimes she’ll wake up on her own. For her birthday, she woke up all by herself. She must have known it was a big day. 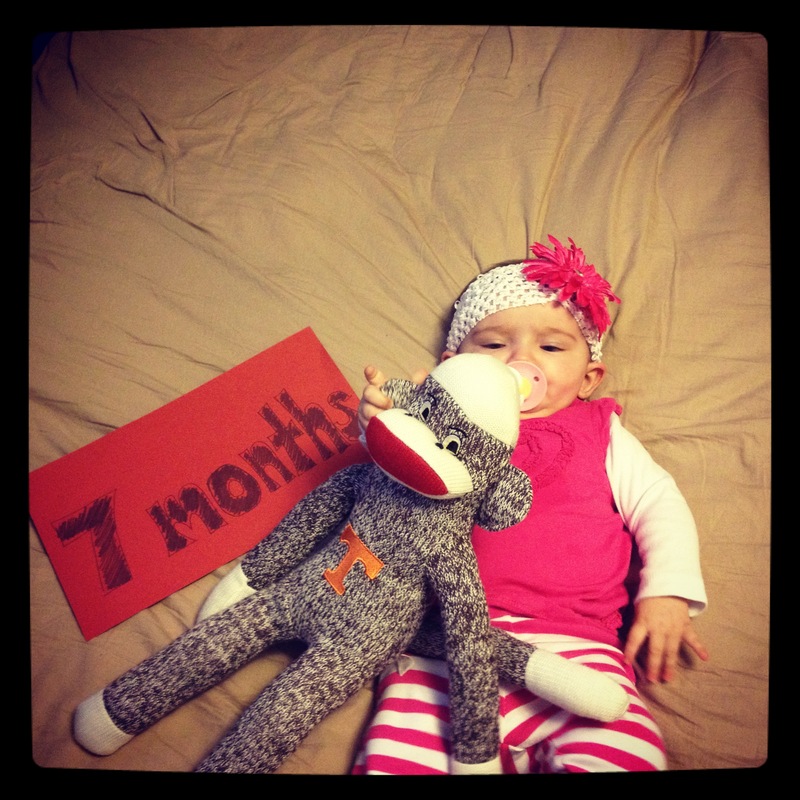 After all, she’s 1 now. She can make decisions all by her big girl self, or so she thinks. 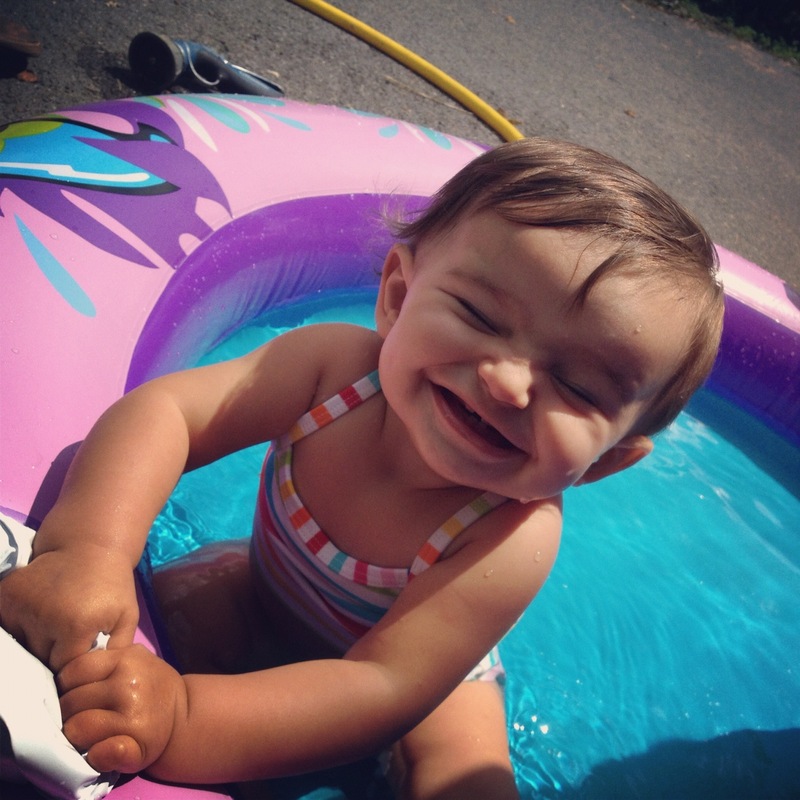 After we finished breakfast, daddy went out to get her new pool set up and ready. We found this on sale at Target for $8 and it was normally $30. I was on cloud nine when I saw it. Sure enough, Emma loved it, too. It took her awhile to adapt to the water. She’s a bath time baby and was unsure of cold water. What is she suppose to do with that? 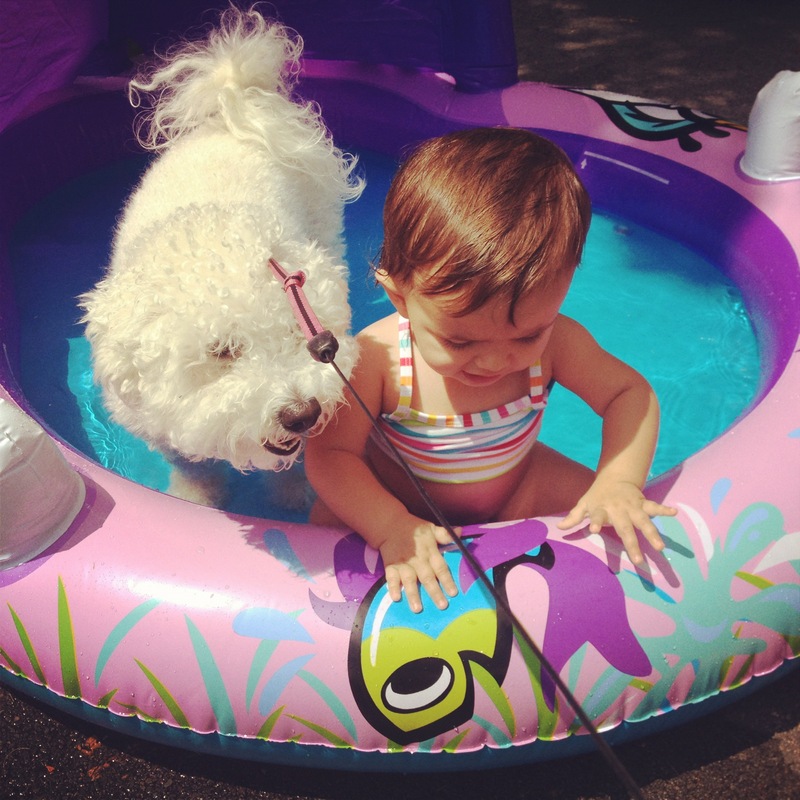 She was a little fussy at first but once Allie jumped in, she was on board with the plan. She played and played and Allie joined in with her. Once Allie was ready to get out, so was Emma. Like peas in a pod. We got cleaned up and decided to make our way down to Bays Mountain. 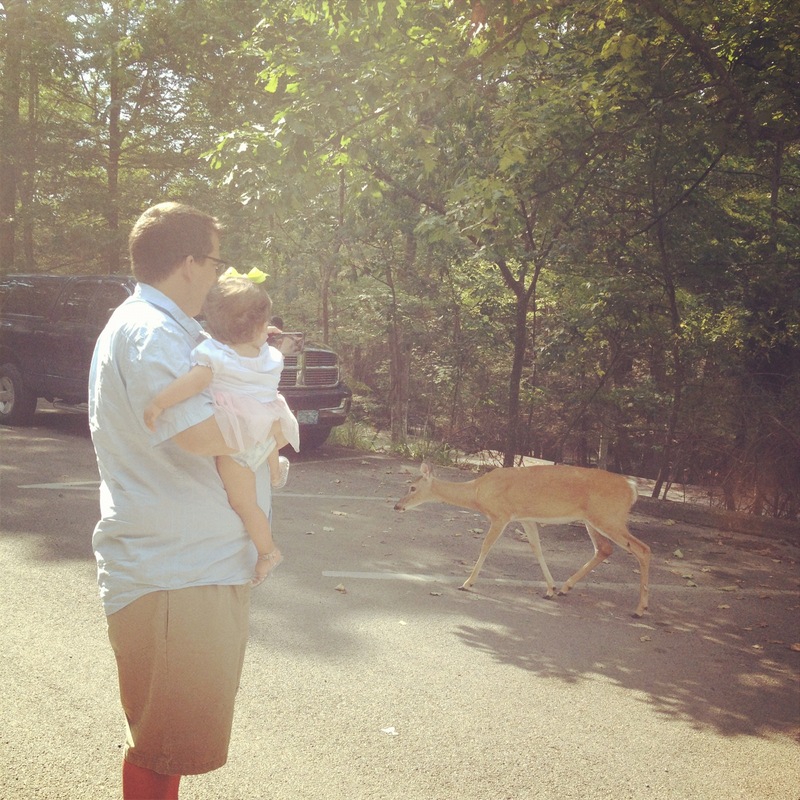 We thought a stroll around would be fun and give her a chance to see some animals she hadn’t seen before that day. She slept on the way down and when we were arrived, we were greeted in the parking lot by a deer. A live deer. A deer that was NOT in a cage. It. Was. Awesome! We were so very excited to see it and so was Emma. She talked to it and asked multiple times, “what’s that?” Typically Emma fashion. The deer mingled around for a little bit and then we made our way to see the other animals in the park. 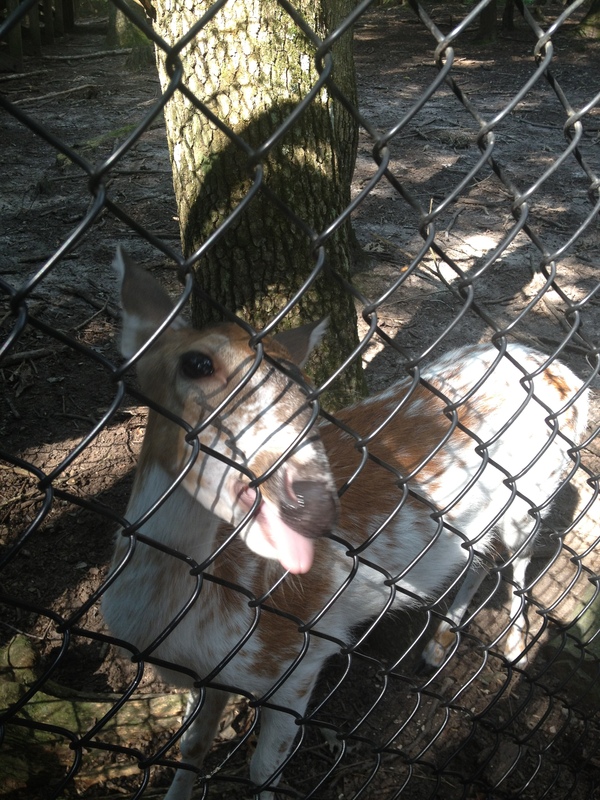 We stumbled upon the other deer that was IN a cage. I felt sorry for it. It was all by itself while everyone else got to run free. I’m not sure he felt so bad though. Living it up with free food isn’t too bad of a life. Next, we saw the bobcat. We looked and looked and couldn’t find him and then he stretched and we saw him as plain as day. Emma was definitely interested. It always amazes me how cats of all kinds act the same and with such elegance. 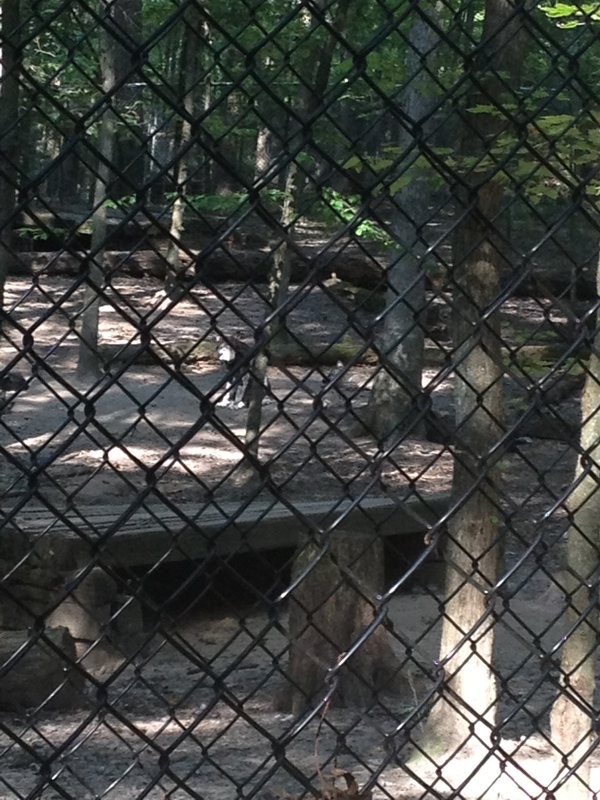 The next thing we visited was the wolf den. There were six wolf pups there. While five slept, the other stood watch. They were lazy like Allie so I’m surprised Emma didn’t yell her name. Other than size and color, they had a lot in common. We made a few more stops along the way until we reached the otter area. We were so disappointed. No otters were out to play and no matter what we did, they wouldn’t come. I considered throwing in some food until I thought I could be arrested. I didn’t want to be arrested on Emma’s birthday. That is NOT the kind of memory I want to make for her on this special day. We spent the rest of our time touring the grounds and going inside checking out all they had. Emma just liked being carried around and taking everything in, one thing at a time. I think her favorite part was the stuffed animals in the gift shop. Of course. Bring her to the wilderness and she wants the fake stuff. After we finished up there, we headed on back to the car to make our way home for Emma’s birthday dinner. After we finished our dinner, made up of all kinds of beans for Emma, we decided to sing a rendition of “Happy Birthday” and let Emma open her gifts. She didn’t know what to think about all of it. She would pull at the tissue paper out and just stare at it. Did mom and dad really get me paper for my birthday? I’m sure she was very intrigued. 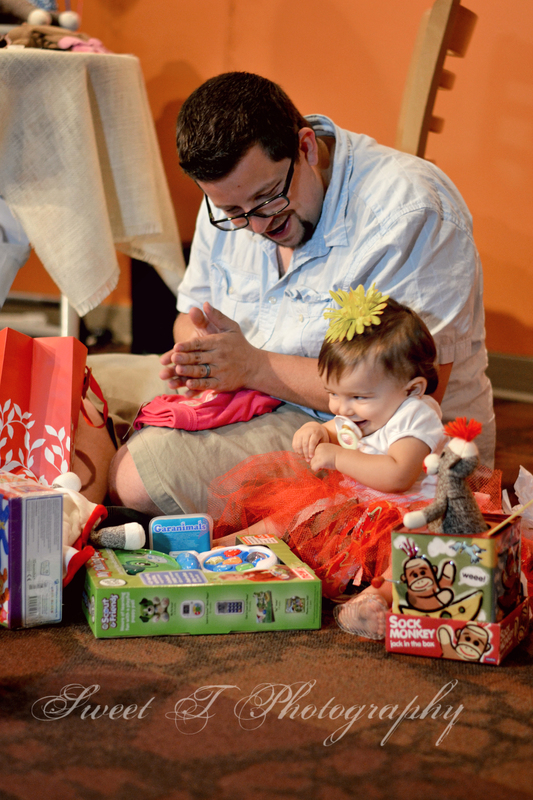 JR would pull out her gifts…and she would go right back to the paper. You can lead a horse to water…well, you know the rest. Finally, the moment had arrived. The pièce de résistance- ice cream. 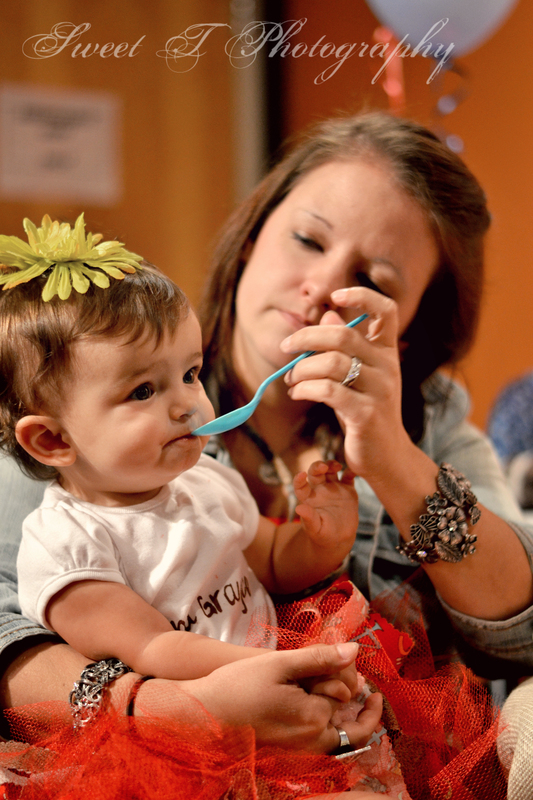 We decided to let Emma give ice cream a try and have her first taste on her first birthday. She enjoyed it. Not as much as beans, but she definitely enjoyed it. After letting her have two or three bites, we told her it was time to call it quits. I know, we’re mean parents. If you had only seen how many beans she ate you would understand. Things were quickly getting out of control. 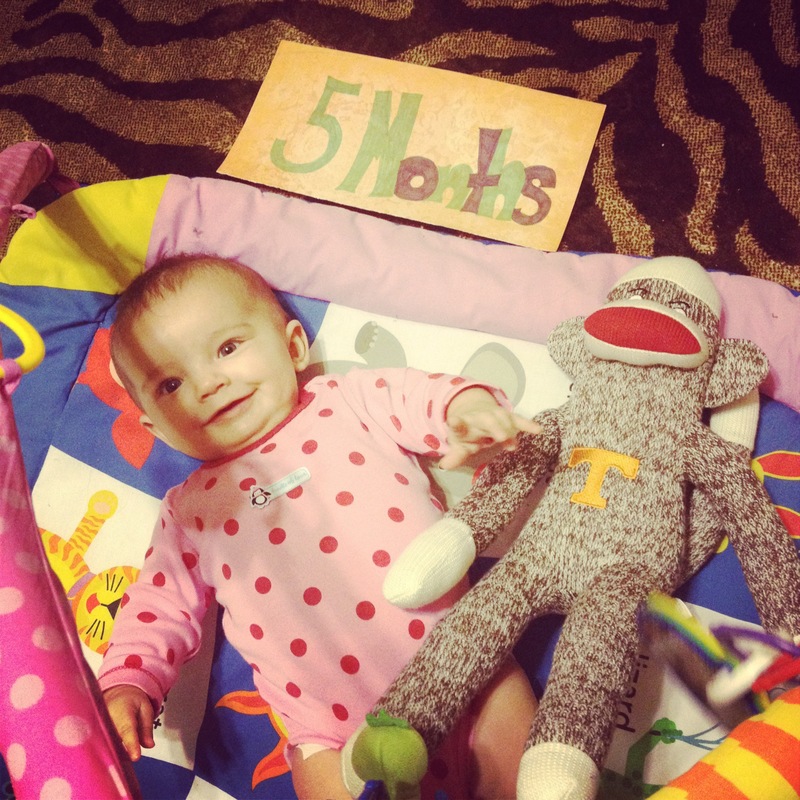 After we calmed her down, she went back to playing with all her new gifts and had a good ole time. 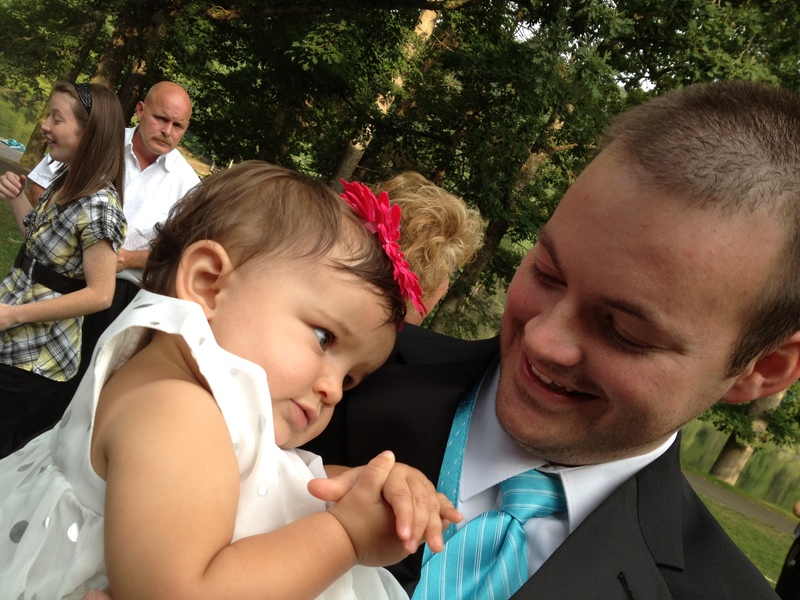 Once it was bedtime, she reached up to her daddy, laid in his arms, and went to sleep. What a birthday! There are a couple of things that we did for this birthday that we think are important. First off, we didn’t spent a ton of money. We tried to do things that were cheap and easy to do. The pool and trip to Bays Mountain cost us $12 (not counting gas). 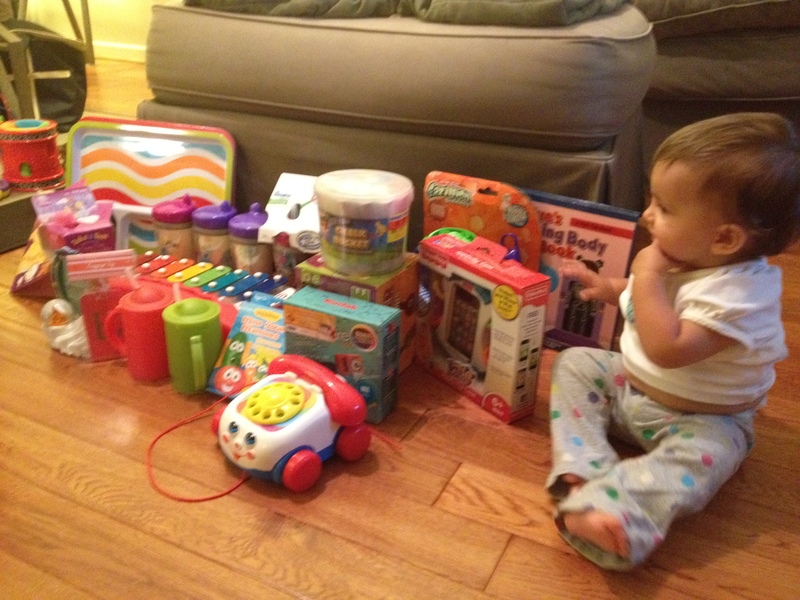 As far as gifts go, we got the majority of them at Wee Cycle It, on clearance, or for free. We only paid full price for one of them and that was $15. The next thing we did was start traditions with Emma. For her birthday, we want to have family time. There will be some years she may not be crazy about it, but we are. This is not only a special day to her but to us. It’s the day God gave us one of the biggest blessings we’ve ever received! It doesn’t mean that some birthdays won’t be shared with others, but we plan to always have a special time on that day just for us as family. A reminder of all the wonderful things God has given us. 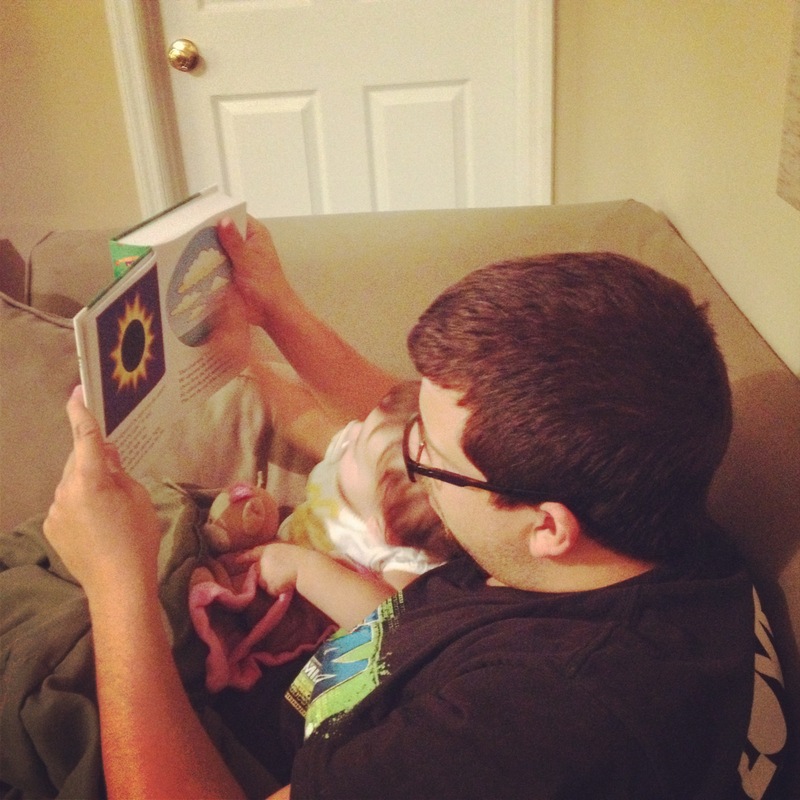 The last, and possibly my favorite, tradition we started was Bible reading nightly with Emma. She’s at the age now that she’s starting to take it all in and enjoys looking at the pictures in her Bible, too. It was so precious watching JR read it to her. We plan on reading a story each night and then once we’re done, we’ll start over. It’s perfect for her age group and attention span. 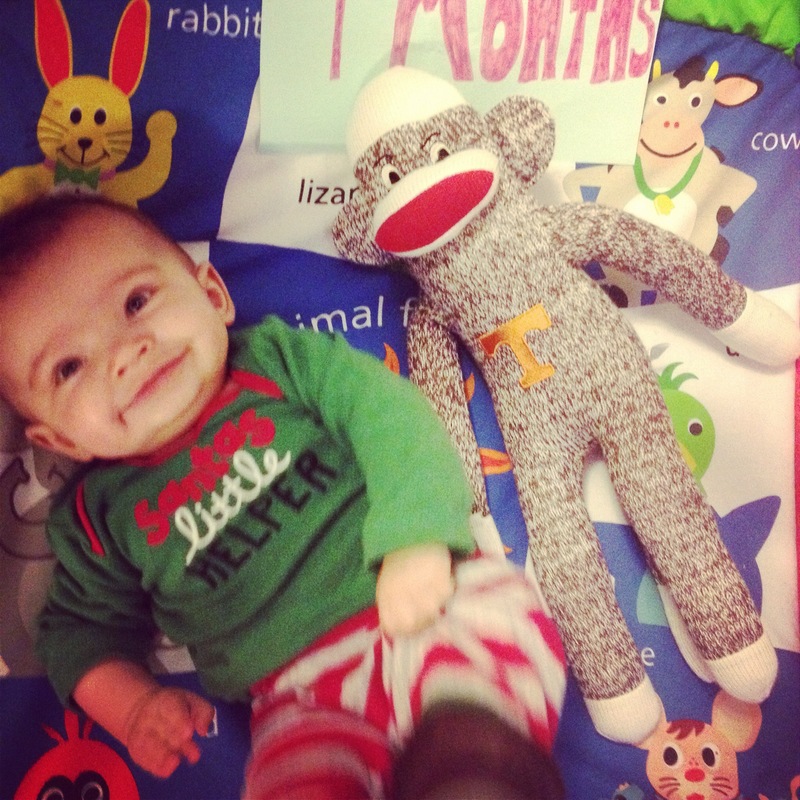 Definitely one of my favorite gifts we ever received! If you want to check it out, this is the one we have. 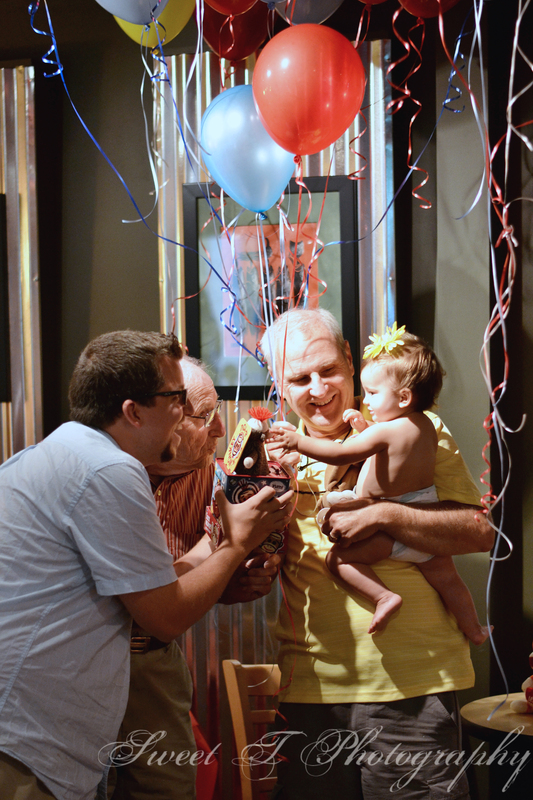 What did you do for your child’s first birthday? Meet Ju Ju Be. She’s the newest addition to our family. I’m sure I sound a little crazy and a little like a proud parent, but once you hear how hard we worked to get her, maybe you’ll appreciate her a little more.We sure do! About a month ago, I did a post on Emma’s diaper bag. Or should I call it my diaper bag? It’s only hers based on what’s in it. I’m the one who ends up doing all the grunt work of carrying it, not to mention I paid for it. My diaper bag or Emma’s diaper bag. It’s still the same thing. Anyways, during that post I talked about the bag we were currently using and how we’ve outgrown it. It’s quickly become too big for us and has more space than we need. We started filling it with unnecessary things simply because there was room. I might have broken my back once or twice trying to carry it around like that. I was fit to be tied and before writing that last post, I began searching for a new bag. As I’m sure some of you can imagine, our diaper bag search SHOULD have went like this: search for a diaper bag, buy the diaper bag, bring it home, fill it up, good to go. What happened at the Linkous house: search for a diaper bag, find something wrong with the bag, search for a diaper bag, find something wrong with the bag, repeat 20 times. Needless to say, I was disappointed. I would find one that I was certain was “the one” and then it was either too small, had bad reviews, or just didn’t work with what we were going for so I held off. When I want something REALLY bad, I take my time. I’m pretty sure this diaper bag search took at least two months. #1- It comes with GREAT reviews, not only online but real life people I know. #2- It was smaller than most bags which was our whole goal for switching bags. 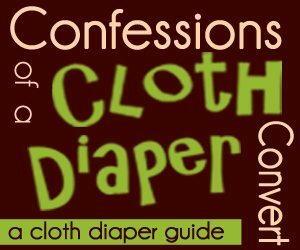 #3- It’s machine washable. Come on now, who doesn’t love a machine washable bag? #4- It has a hole for crumbies! And believe it or not, I came up with that word on my own. JR convinced me I got it from the demonstration video but guess what? They said crumbs. Crumbies is my word alone. #5- It has a shoulder strap that makes it a crossbody bag. I love crossbody bags. When you’re carrying a baby, a pump bag, a purse, and a food bag, there’s little room to carry a diaper bag, too. My favorite thing to do with it is to dump my phone and wallet in there and carry Emma. It gives me the option to carry her without readjusting any straps. This is my main reason for loving this bag so much! I have had (3) diaper bags so far and don’t plan on ever getting another one. This bag is a keeper. I have fallen in love and made a vow to keep this bag FOREVER. Don’t you love it when you find a win like that? It holds almost as much as her bag did before, minus some of the junk we were carrying around “just because”. I was honestly surprised when I first got it. It was small, just like I thought, but I couldn’t envision making everything fit. I pulled it all out of the other bag, laid out what we were keeping it in and what were getting rid of, which wasn’t too much. I started putting it in the bag and with all the little spaces here and there, it fit and fit well. I love how a bag can make things look smaller and fit the same stuff in them. 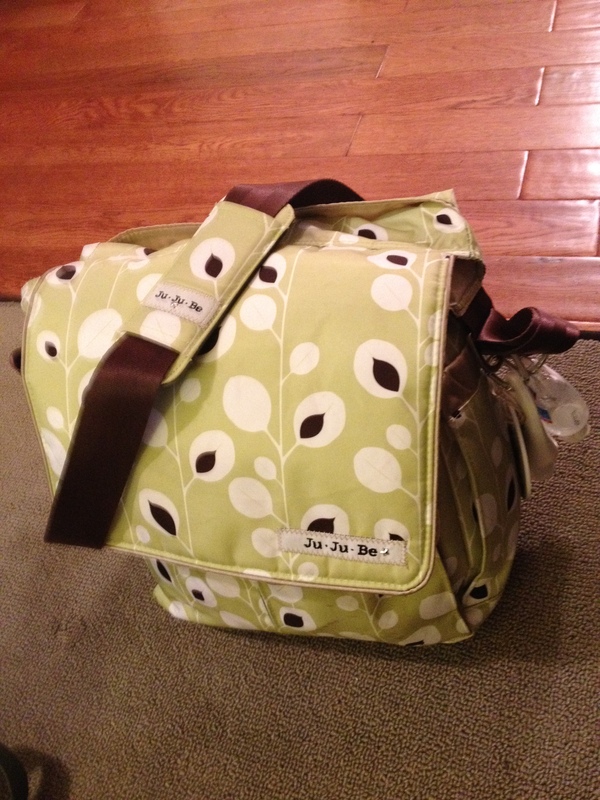 Ju Ju Be is definitely a positive name around the Linkous house and we highly recommend it to anyone who wants/needs a diaper bag. If you want to come check mine out, feel free to do so. I love to show it off, even to my friends that aren’t parents. They might be one day and I would hate to think they spend a lot of time and money getting the wrong bags when they could get the right one, right away. Here is a link to the videos of all the bags they have, including the Ju Ju Be “Be Hip”. Check it out and see what you think. There are a TON of other bags and accessories so take time to browse around and see what else is offered. What kind of bag do you have for your baby? What has been your favorite? Last month, I was so blessed to work alongside Over the Rainbowtique. For those of you who weren’t with us then, you can check it out here. I love finding a store that I can fall in love with and be able to afford their products. It’s not every day you find that kind of combination, but with Over the Rainbowtique, you do! I was very excited to receive my second order from Noel, owner and founder of Over the Rainbowtique. It was like Christmas morning when the package arrived! I talked to Noel about Emma and how she’s our little monkey and how much I would love to have hairbows that had monkeys on them for this reason. In a matter of days, Noel had 3-4 bows for me to choose from in her inventory. How awesome! Most places would have to have more than one person recommend something before they would do it and most places probably wouldn’t even listen to just one customer. But Noel did. I fell in love with all of the bows, but mainly fell hard for these this specific one. 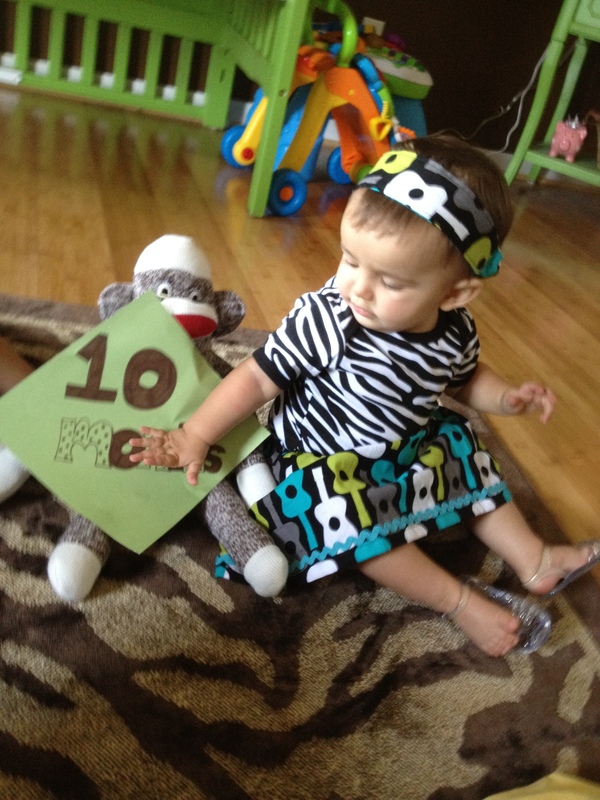 My absolute favorite was pairing this green monkey bow with her animal print Gymboree dress that my friend, Bethaney, got her when she was born. The combination of the two looks so safari style and is perfect with the monkey theme. We got another bow that has monkeys on it but with some lighter colors. 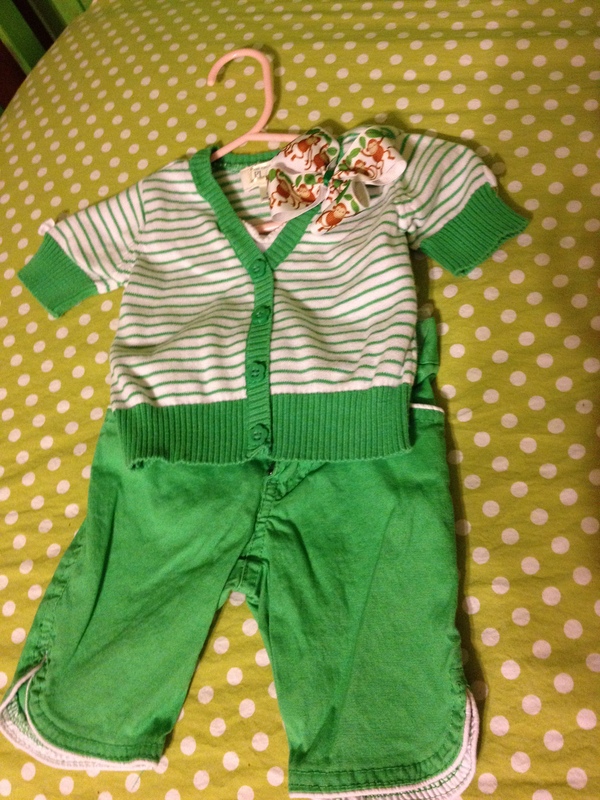 I matched it with this Children’s Place set that I’m pretty sure came straight out of the 1970s. I’m in love. One of our dear friends let us borrow this set and it’s up there as on of my favorites. It reminds me on an outfit I had when I was little and wore one time when we went to Hilton Head Island on vacation. My parents had good style apparently. 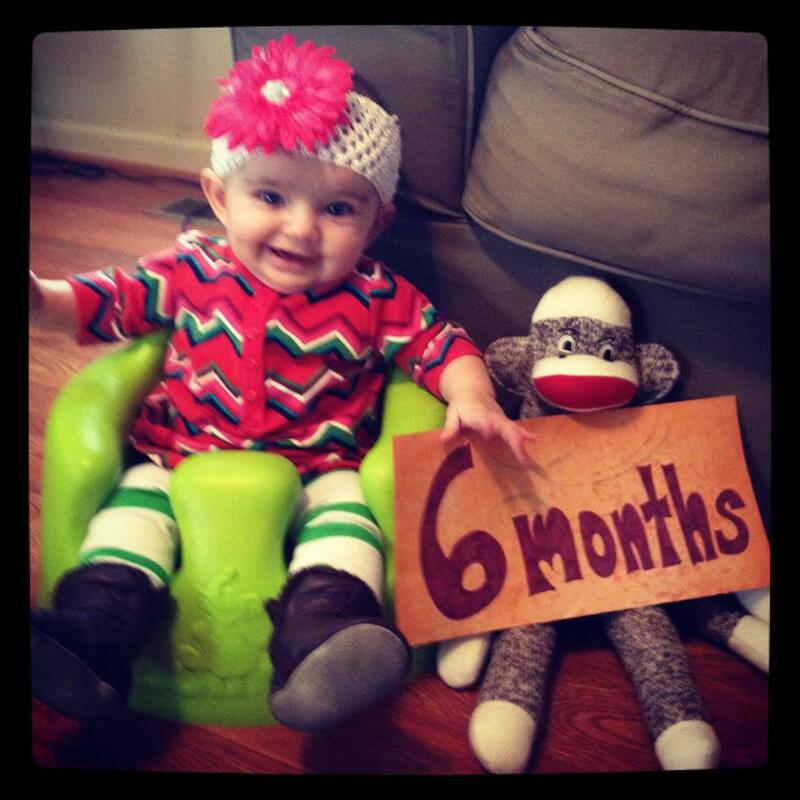 Emma is getting ready to rock this outfit, too. She’s still a small little girl so it’s taking her a little longer to fit into these outfits. I’m pretty sure I’d rather her be petite so you’ll hear no complaints from me, that’s for sure. Another piece we got was this retro pink bow. I love how it looks like something my momma would have worn. Too cute! 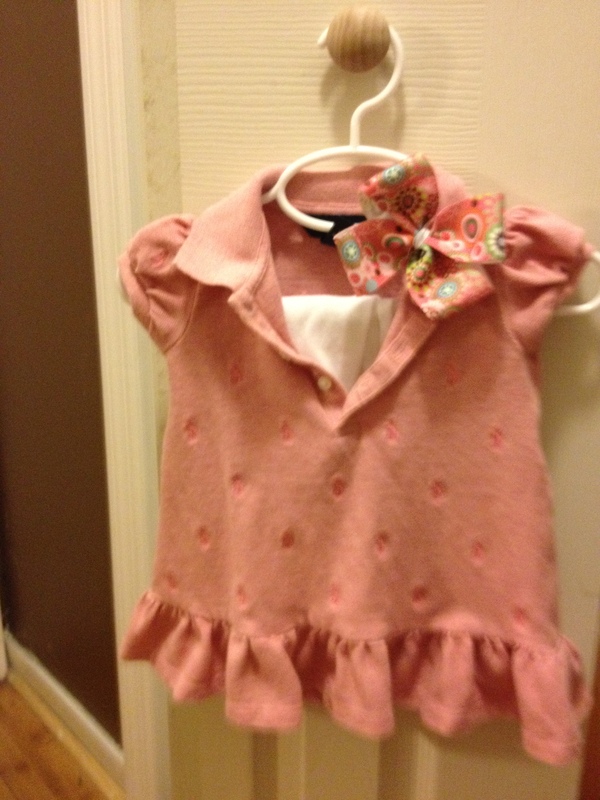 She got this little Ralph Lauren set as a gift and it looks retro, too. The white leggings bring it up to date and the entire combination is perfect. When I bought this bow, I had NO IDEA what she was going to wear it with but I loved it enough that I just knew I had to have it. 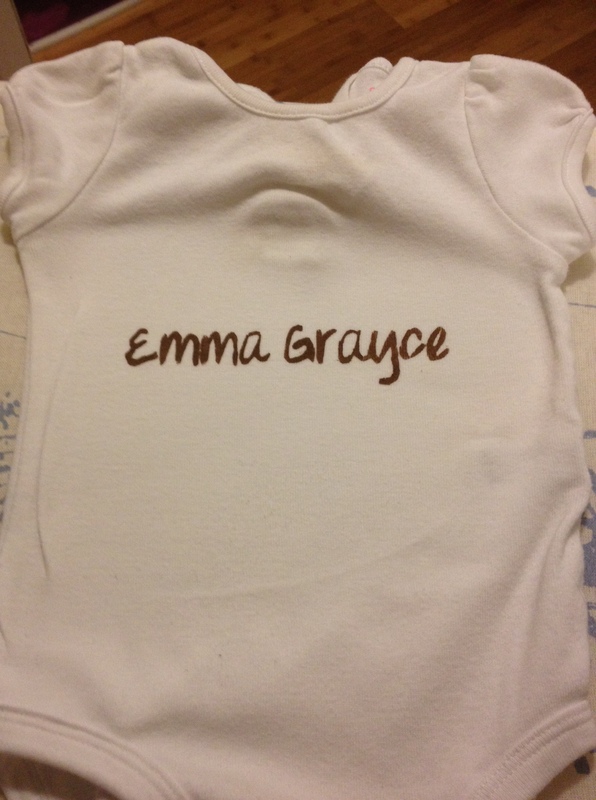 When we pulled out Emma’s next stage of clothing I saw this and knew it was a win. Thanks Noel! We also got this brightly colored bow. It has a TON of bright and vibrant colors in it, which matches a ton of Emma’s outfits. We’ve put it with a few of her birthday sets as well as a few play outfits to spice them up. 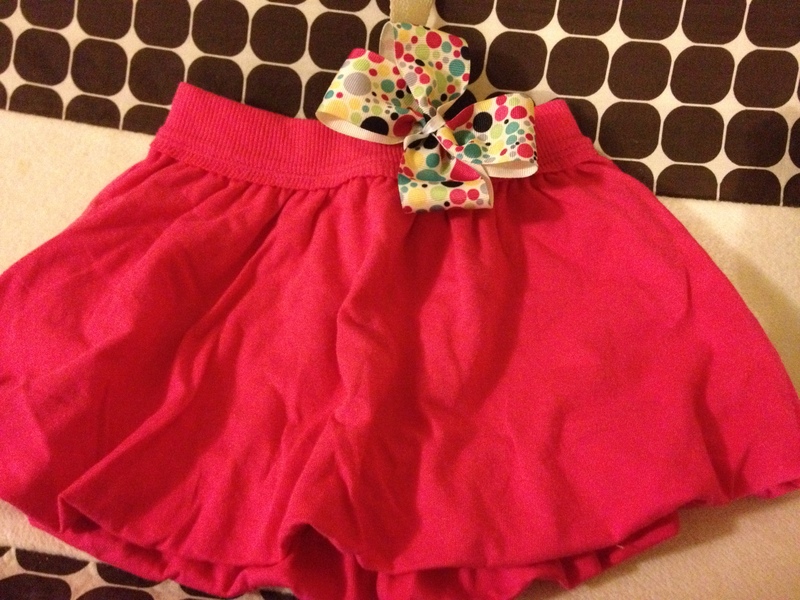 I think my favorite will be this new pink bubble skirt she got for her birthday. I seriously cannot wait to pair the two together. The great thing about this set is you can pair it with just about any other color since the bow has so many colors mixed into it. It would even look fine and even pop a little more with a color as simple as white. I love it when I can take a simple outfit that’s cute and spice it up with a little extra piece. The last thing I got was this bow holder. 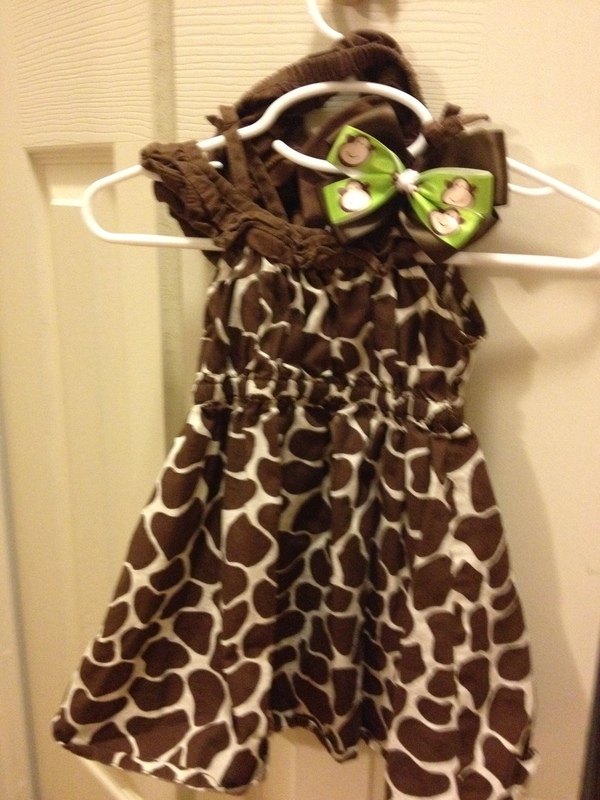 It’s got a mix of animal prints in it, which matches Emma’s safari themed room. She even loves this item. There’s something intriguing about it hanging from her closet door that makes her just gravitate towards it. She goes nuts over it. We try to keep her eyes off of it as best we can. This is something that’s more for me than for her. It helps hold her bows from Over the Rainbowtique. As you can see, it’s getting very full and before long, we will need to invest in another one. Whatever will we do? Noel has once again offered a great deal for all the readers here at Embracing Everything Emma! If you visit her website starting today, going through next Thursday, September 6th, you will receive 20% off your order! You can order one piece or twenty and the offer will apply. Thanks Noel! The code to make this order happen is bowsale20. 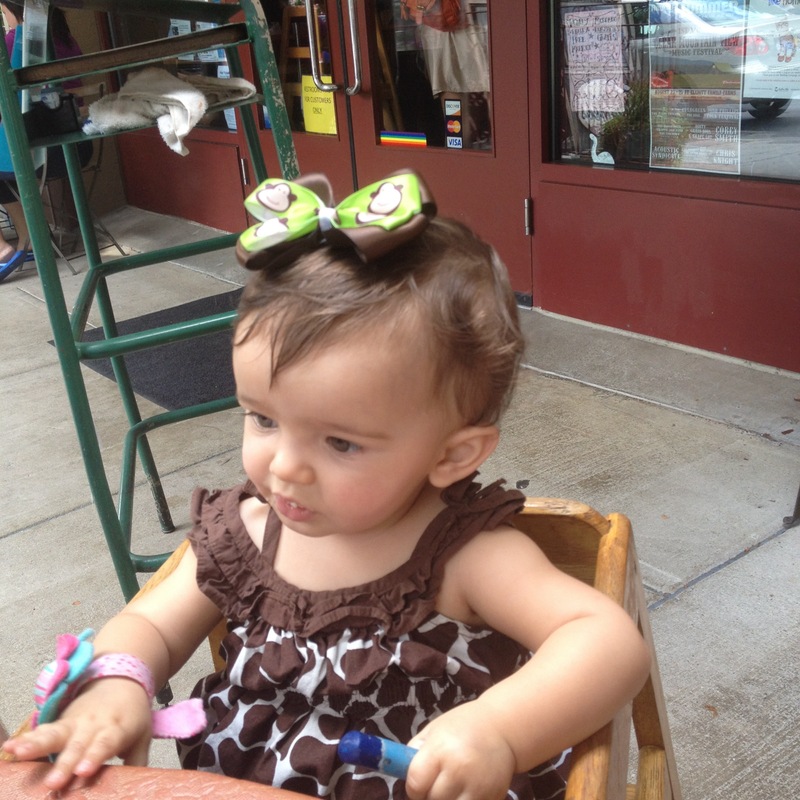 Have I mentioned how much we love these hairbows at our house? But sure to check out our Disney vacation in the next month for posts of all these bows appearing there. 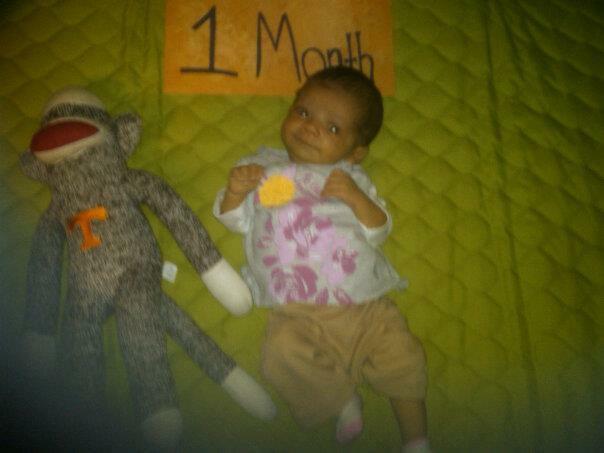 We can’t wait to dress her up and use these bows to coordinate her outfits. 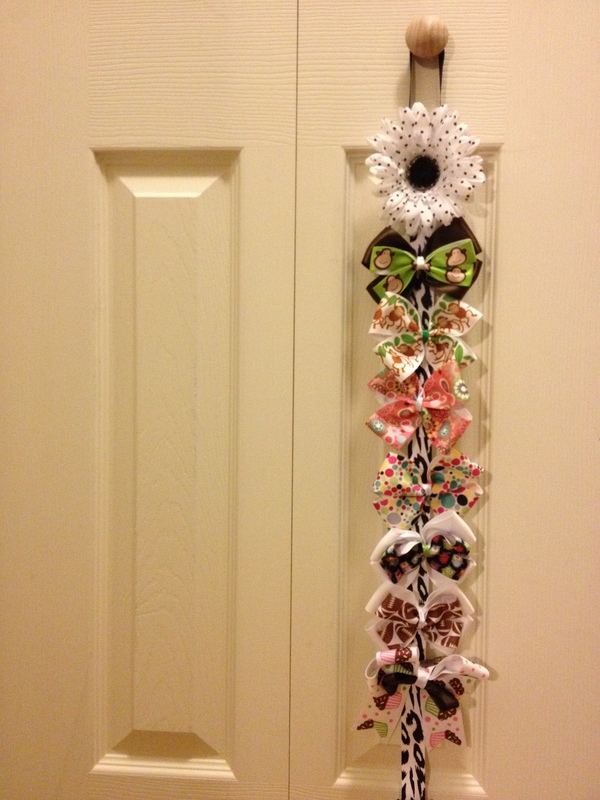 What bow or piece from Over the Rainbowtique is your favorite? For as long as I can remember, my brother has been my best friend. I guess it’s been that way for my entire life. When I was growing up, I would spend time with my friends but my favorite person to spend time with was Erick. I remember countless nights of staying up late just hanging out and a childhood of playing school and make belief. As we grew older and could drive, we would make regular trips out to eat, to the moonlite, and pretty much anywhere we could go. I pray that Emma is blessed with the same kind of relationship with her sibling(s) whenever God blesses us with another child. From what I hear, this is rare. I talk to people about how close I am to Erick and people are in disbelief. Apparently, being best friends with your sibling isn’t the norm but it was at the Puckett house. On Saturday, August 18th, my brother became a married man. It was bittersweet. As I watched him, I am not ashamed to say I cried. I pictured this little boy with his blanky and paci. I pictured a little boy in his dinosaur costume walking around the house, but refusing to wear it for Halloween. I pictured MY little brother saying to me, “I love you sissy”. And then what I saw was a grown man waiting for his beautiful bride, the woman that God has created just for him. I have never been more proud of him. 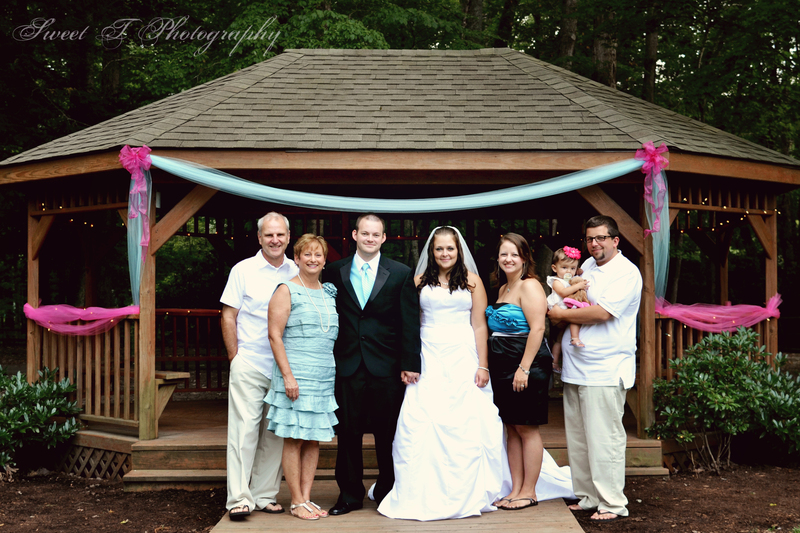 I was blessed to be a part of their wedding party and hear him repeat his vows to her and vice versa. Hearing him choke up as he gave a commitment of a lifetime to a woman that he would lead for the rest of his life was such an honor. 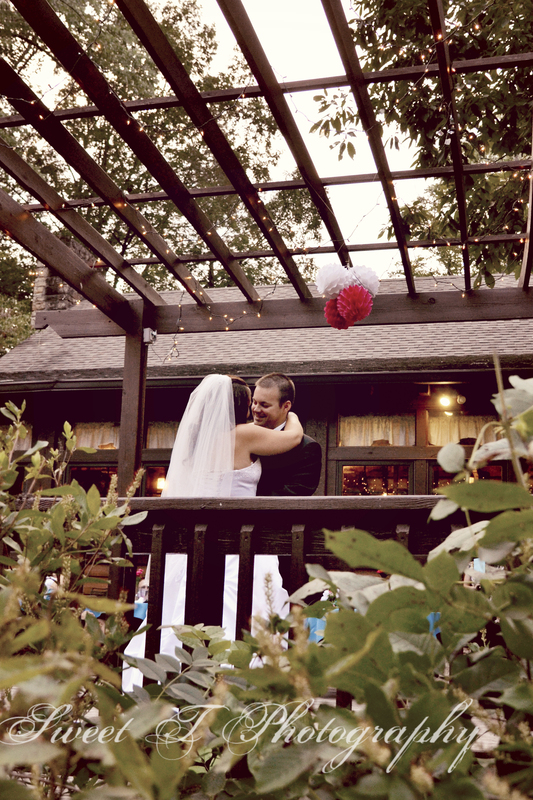 We were able to share in their reception and watch them dance, share cake, and drive away for their honeymoon. I will admit that once it was over, I wished it had not come quite so quickly. I longed for the days of our childhood where it was just me and him. I realized how quickly time had passed us by and here we were, both grown and married. I was so very blessed to be able to decorate for their wedding and early Saturday morning I went to mom and dad’s to pick up the supplies. Erick met us out at the car and I was given a brief moment where it was just me and him. I was able to hug him, tell him I love him, and how proud I was of him for taking this next step in life. That moment will always remain as one of my favorites. 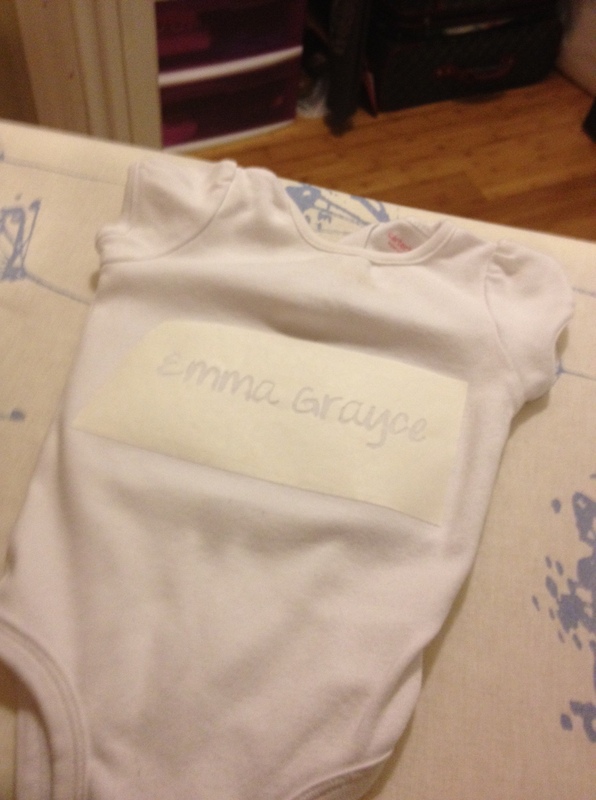 Now for the main reason I wrote this post, Emma has a new aunt! Truthfully, Jessica has been Emma’s aunt since the moment she entered the world. She stayed at the hospital with us while we awaited her birth and came to visit after work the next day. 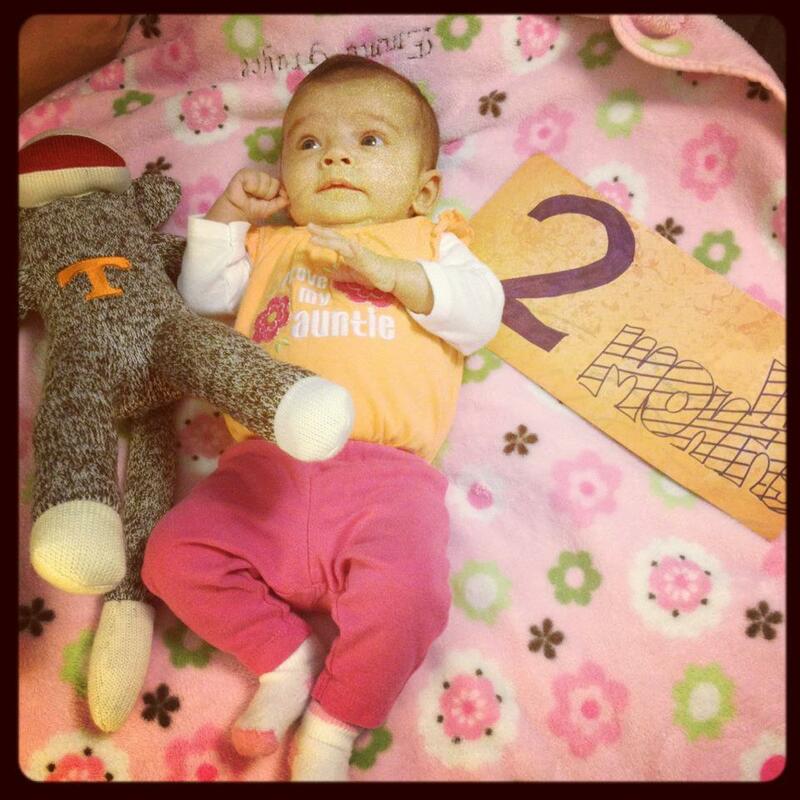 At six weeks old, Emma entered daycare with her aunt Jessica. She has been her provider during the weekdays for the past year. In some ways, Jessica knows Emma better than anyone else. So, you can imagine why we believe Emma was her niece long before the vows came into play. Emma loves Jessica, too. At daycare, there were many days that Emma did not want to stay. She would start to cry and I knew it was going to be a hard morning, however, as soon as she saw Jessica everything was fine. Mommy who? Jessica made her days better and she looked forward to the days they had together. 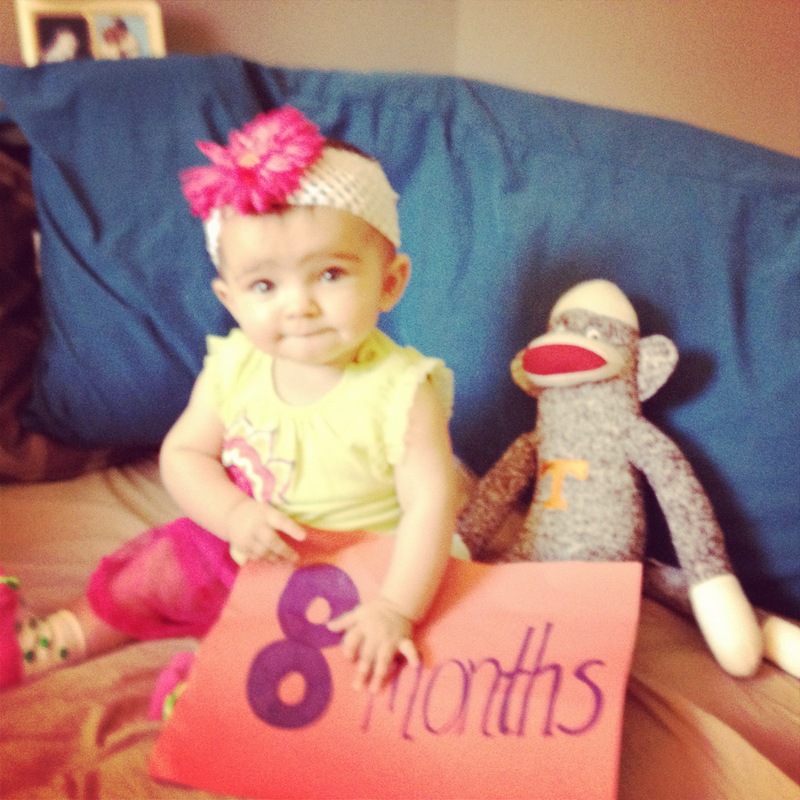 Now that Emma is a year old and out of the classroom, we have moved Emma to childcare at home. 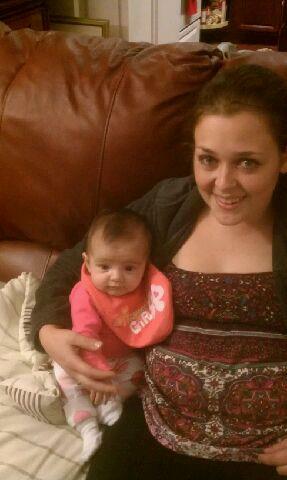 We will have to be more intentional of the time she spends with her aunt Jessica but luckily we have a lifetime now. She’s stuck with us. Ha! They asked Emma to be a part of their special day and we were so thankful for this. 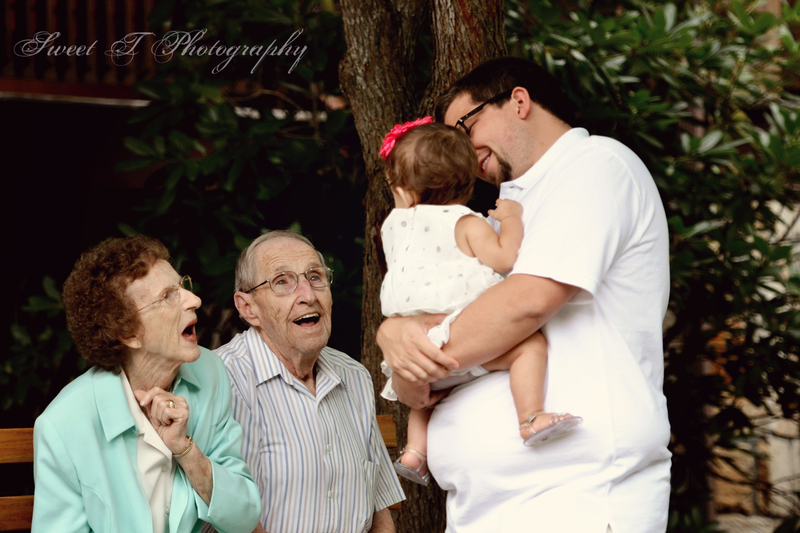 She will be able to look back on pictures of the wedding and know that they cared about her enough to allow her to share in this moment with them. She may not remember it, but she had so many special memories made this day that we will be able to share with her in years to come. We are so excited to see where God leads Jessica and Erick in the years to come. We will be praying for their marriage daily and would ask you all to do the same. Marriage is something that isn’t always easy, but doing life together is so much easier than doing it alone. Life is better with a helpmate and I am so grateful that Jessica and Erick found one another. Some people live a lifetime alone and never find their soul mate but they have. God has truly given them a special gift. With all that being said, we give Jessica a special welcome to the Puckett family and her new life as Erick’s wife, and Emma’s very special and very loved aunt. 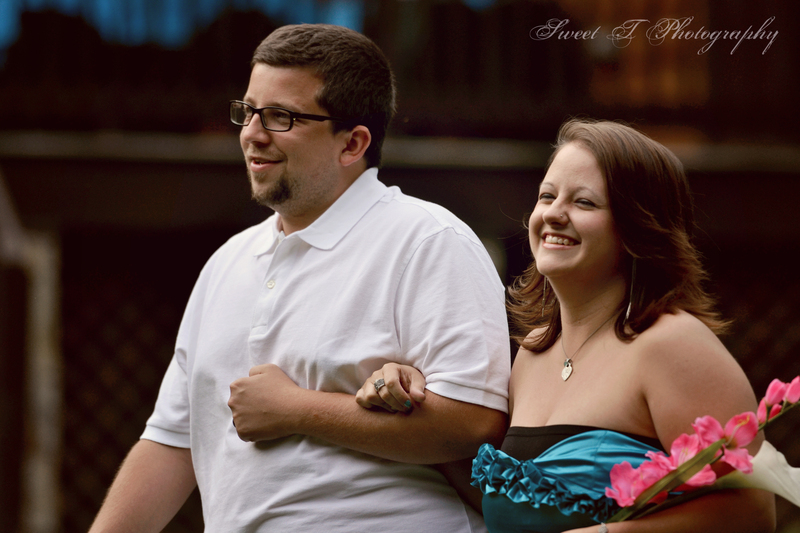 Below are some wonderful shots from the wedding, credit to Sweet T Photography. Be sure to check it out! Today is the big day! 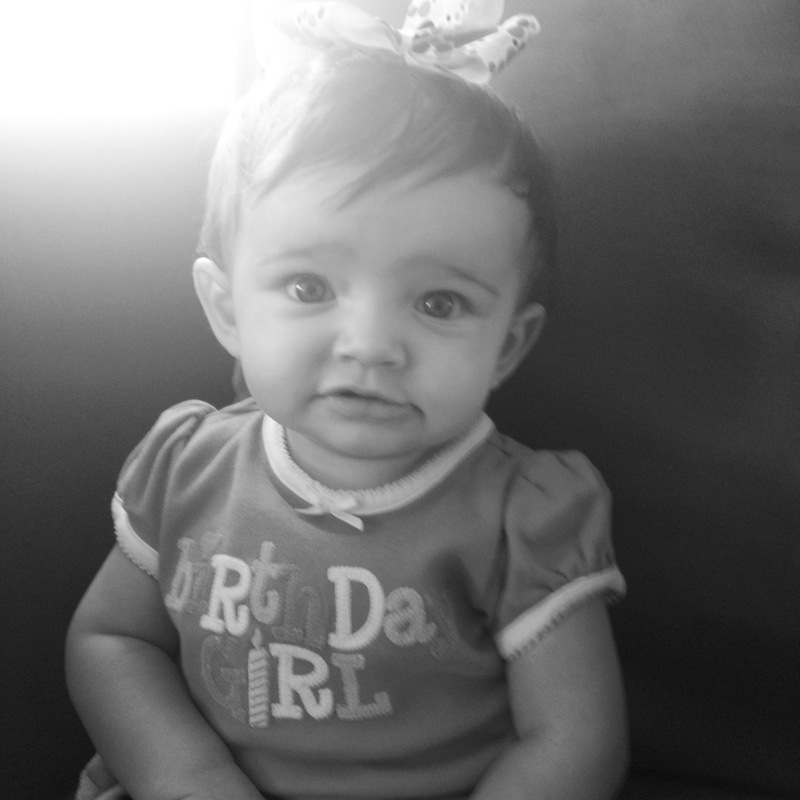 Our sweet Emma Grayce turns ONE! There will never be another birthday like it, but we know there will be many more years to come and they’ll just keep getting better and better. 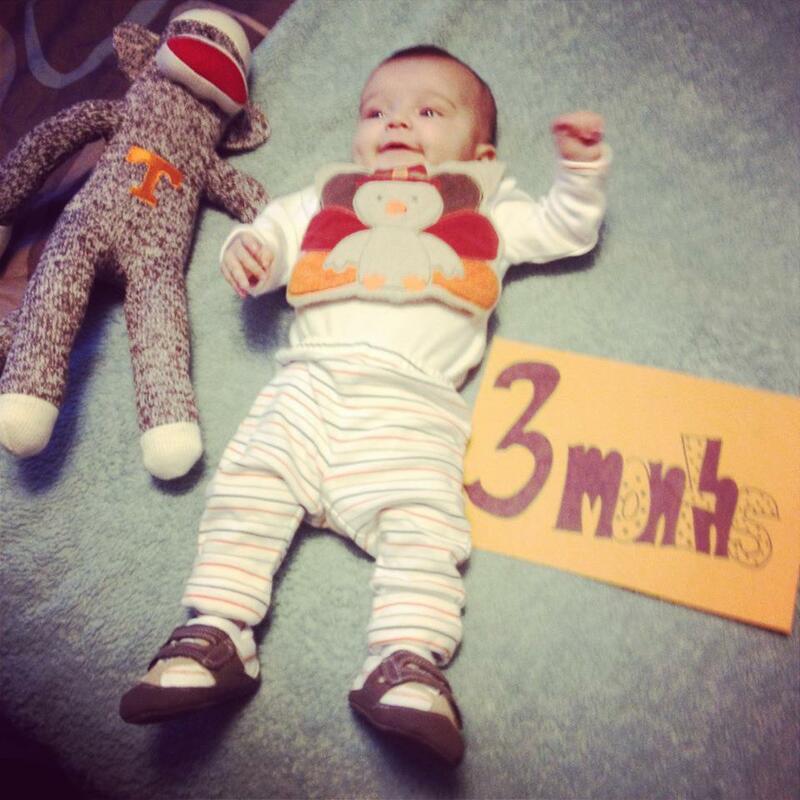 We love our sweet little girl more than words can say. We are taking the day off at Embracing Everything Emma to enjoy our day with her, but wanted to share with you a glimpse of the months spent with Emma and how she has grown. Join us Monday as we dive into another week at Embracing Everything Emma! When I began the project to make Emma’s tutu for her birthday party, I was satisfied with a plain red shirt to go with it. Certainly I wasn’t required to make another clothing item to go along with it, was I? As I looked at her outfit and envisioned it, I felt like I had only done it halfway. I couldn’t get past the fact that the bottom piece had so much work but into it and the top did not. Then and there I decided that I needed to make a top to go along with it. I also decided right then and there that I wasn’t going to spend three hours on this project, too. I have a birthday party to get ready for now! I had a plain, white short sleeve onsie that cost me .50. Not bad! I decided to go with something simple rather than a detailed design since Emma’s skirt was so detailed. 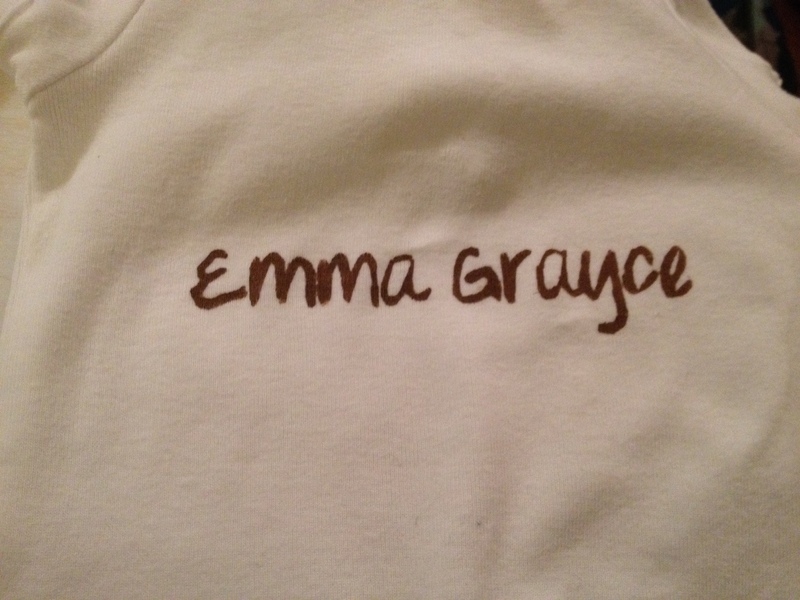 I decided to put her name, Emma Grayce, on the shirt. I printed this off and it didn’t cost me anything. Well, maybe .01 but not much. The freezer paper I borrowed. Well, it was given to me. I have no intentions to return it. I have NEVER used freezer paper and hated to buy it for this one project. I have a wonderful friend who cooks and bakes regularly and I was certain she would have some. Sure enough, she did! She was kind enough to give me a foot of her freezer paper so I didn’t have to go out to the store. Plus, I hear it’s hard to find freezer paper anywhere other than Walmart. Gag me. 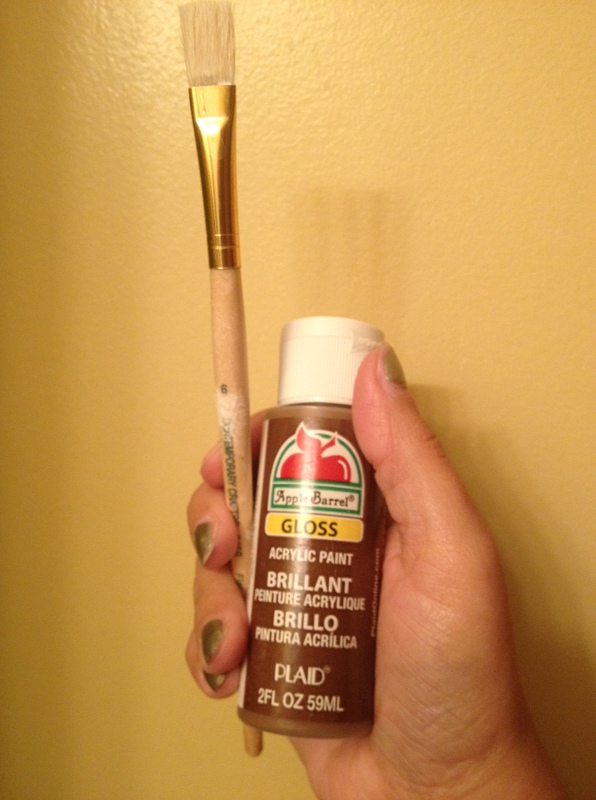 The acrylic paint I had with my crafts along with my blade. As far as the iron and board, I have both of those. Do I use them? No. But I do have them.My total cost for this personalized shirt was .51. And the total time spent? You’ll have to join me to find out! 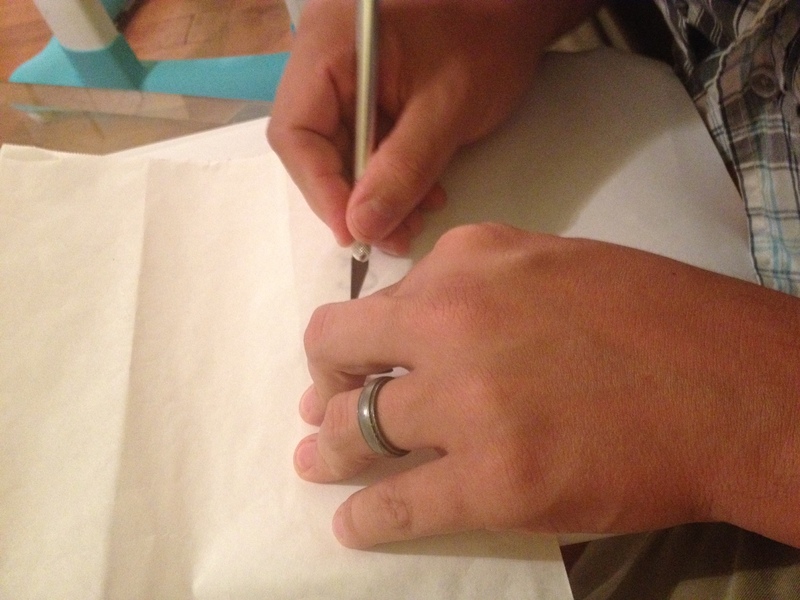 I sat down and began my tracing project with my x-acto blade. Seriously? This is nuts. I don’t have much patience so this really tested me. Having to trace a name and then cut out the little letters in the “a’s” and “e’s” was enough to drive me crazy. I almost had a meltdown doing just the first letter, so JR stepped in to help out. He did such a great job that I let him finish this part. Thank goodness for JR. Otherwise this post would have never happened. The good news is if you print your artwork in black ink, it will be very easy to see when you put the freezer paper on top of it. Also, make sure you your husband traces it with the shiny side down. Trust me, you’ll regret it later if you don’t. After this step, I had to iron the freezer paper onto the shirt. I was a nervous wreck. I have never been one to be good at ironing, since I never iron. I watched this part of the video over and over again. This is where it’s important to remember which side to trace. 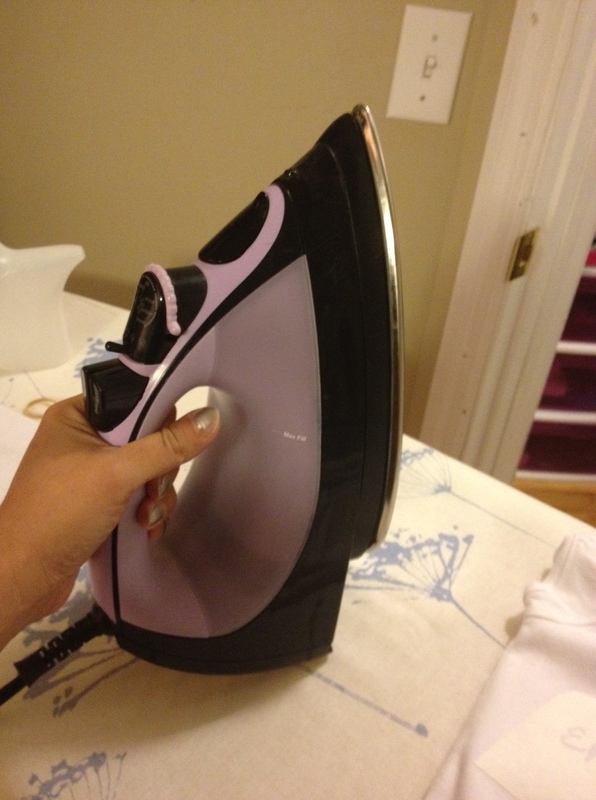 The SHINY side goes down so the iron doesn’t touch it. The flat/matted side is up for the iron to touch. If you do it opposite you will have freezer paper stuck to your iron. For those of you who use your iron, this would surely be a bad thing. Keep in mind that you’ll need to replace your tiny fill in letters. I would wait to do this until AFTER you have ironed on the first part. Once it’s set and not budging, put the tiny pieces in place and press straight down with the iron. Lift up and do it again a couple of times. Then take a few extra moments to smooth over the entire piece of freezer paper with the iron. Better safe than sorry. Once you’ve felt the letters to make sure there are no loose spots, you’re good to paint. Oh, and did I mentioned shiny side down? The next thing to do is to paint. Remember to put a piece of paper IN the shirt so your paint doesn’t bleed through it. It would be awful, especially if you use brown like me. 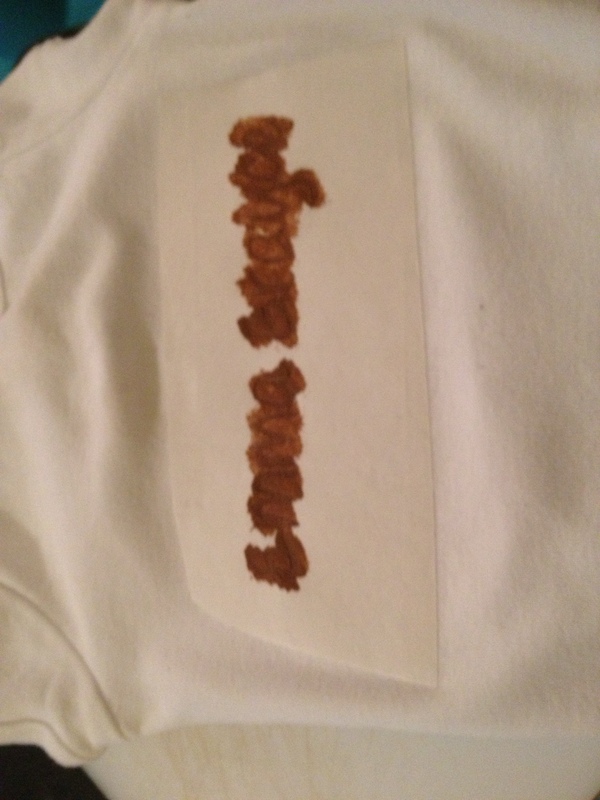 No one wants pretend poop stains on the back of their daughter’s birthday shirt. You can also use multiple colors for this project. As stated before, I chose to use a plain brown color since her skirt was so detailed. Brown seemed to fit well against the white and stood out like I wanted it to do. Something I was going to do was paint from the paper onto the shirt. I saw this idea on the video. This way, the paintbrush wasn’t tempted to go underneath the paper and onto the shirt. My letters were so small that I decided to blot instead. It basically made sure the same thing didn’t happen. I would surely have lost my mind had I made it this far and had this mess up. Luckily, I did have extra shirts just in case. What I didn’t have was more time for my husband to trace more freezer paper. Thanks again baby! The next part was simply taking time to wait for the paint to dry. It didn’t have to be perfect but needed to be dry enough. You don’t want to smudge your paint but you also don’t want it to stick once it’s dried completely. Such a touchy thing to do. I waited about five minutes and then took it off, with my fingers crossed. Thank goodness it did fine. Also, for the tiny pieces on top of the “a” and the “e” I used tweezers to pull them up. I didn’t want to accidentally smear those all over the shirt either. 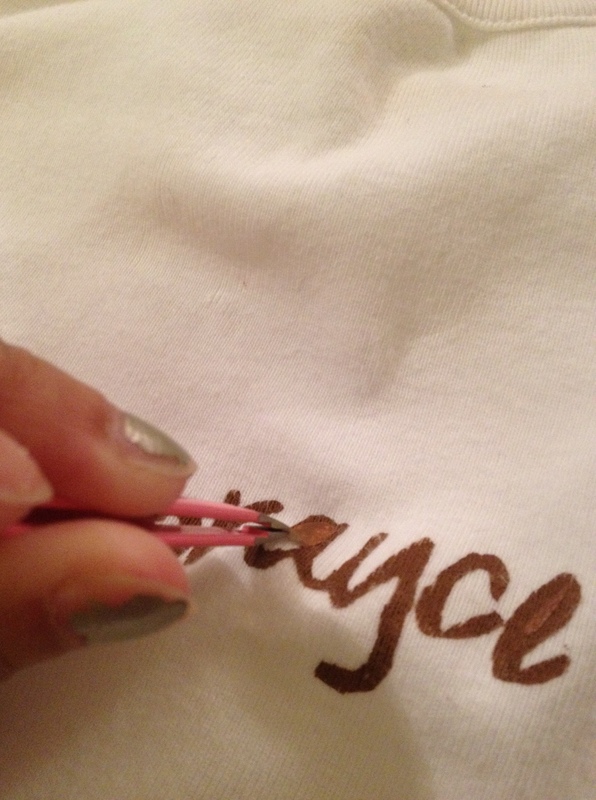 The last step was touching up the shirt with a few final iron strokes over the finished shirt. This helps to give it a good, quick seal. I swiped my iron over it quickly, vowing to not use my iron again for the next year. I try not to use it more than I should, which is just about never. Have I mentioned I love the cleaners? If I’m ever in absolute need of a good ironing this is where I go. It doesn’t necessarily fit into my cheapo budget but sometimes a girls just got to set some boundaries. And ironing is where it is for me. So that’s how you make a DIY shirt for your child. I have seen some amazing ideas on different websites that are a lot more detailed than mine. Maybe one day I’ll do something a little more extravagant. I’ll only do it if JR traces it. For me, sometimes patience is not a virtue. And it’s definitely not when it comes to tracing freezer paper. Have you ever made a DIY shirt for your child? How did you do it and what did you do it for?